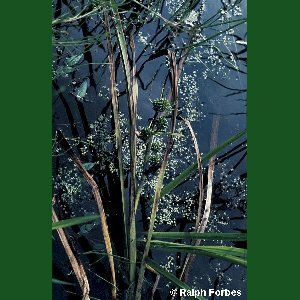 All other duckweeds float on the surface of ponds, canals or other water-bodies, but this species floats below the surface. The individual plants are composed of tiny oval 'leaves' with a stalk at one end. Each 'leaf' has either one root or none, and they are joined together by their stalks to form clusters or chains of plants. All names: Lemna trisulca L.